Early trends in December quarter corporate earnings indicate a revival in business growth following a downturn in the aftermath of the November 2016 invalidation of high-value banknotes and the July 2017 implementation of the goods and services tax (GST). A review of earnings reported so far suggests the return of demand although it is too early to conclude if disruptions from the implementation of the GST have fully faded. According to data provider Capitaline, growth in net profit after adjustment for one-time items of 103 BSE-listed firms which have reported earnings so far jumped to a 13-quarter high, rising 23.02% year-on-year in the December quarter of FY18, against 4.92% in the preceding three months. 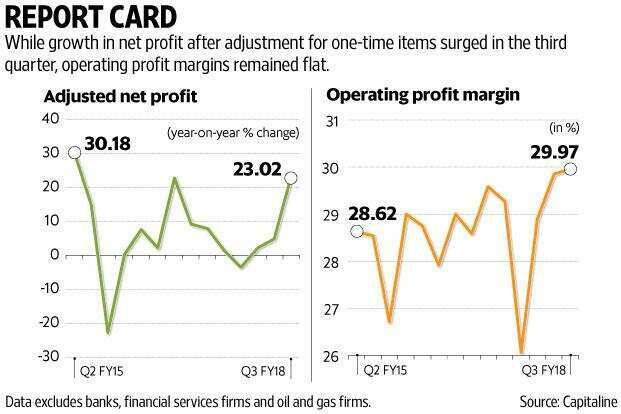 Operating profit margins of these firms, however, were flat at 29.97% during the quarter, against 29.86% in the preceding quarter. Raw materials cost for the same set of companies rose 12.5% in the December quarter compared to the preceding quarter as Brent crude prices rose 16.21% in the October-December period. The earnings review excludes banks, financial services companies and oil and gas companies. There were expectations that the earnings recovery will gain momentum during the quarter due to last year’s low base caused by demonetization and the fading impact of GST-led disruptions. Teena Virmani, vice-president (research), Kotak Securities Ltd, said earnings so far have been better than estimates, led by demand improvement and the benefit of last year’s low base. “Post the GST rate changes incorporated in the month of November, demand started witnessing improvement in double digits in most consumer-related segment. Also, sequentially, the results in Q2FY18 were impacted by monsoon as well as GST implementation. The recovery in demand has been witnessed post Q2FY18 contributing to earnings in Q3, though prices have declined sequentially due to GST rate changes," she added. Pankaj Pandey, head of research at ICICI Securities Ltd, said the effects of demonetization are fading. Businesses are not feeling the impact of it anymore and the transition to the new indirect tax system under GST is almost over. “Earnings have been more or less in line with expectations. We were expecting double digit growth for domestic-oriented sectors. There is a consumer demand pick-up which led to it. Commercial vehicles sales data is a good economic lead indicator and data for last month suggest an increase in consumer demand," he added. “We believe that the government would allocate higher spend for rural and agriculture segments ahead of 2019 general elections. The Q2FY18 commentary, as well as our recent interaction with companies in the FMCG (fast-moving consumer goods), auto, durables and NBFC (non-banking financial company) sectors in November and December 2017, confirms the bottoming out of rural consumption," wrote Motilal Oswal Securities Ltd in a note. The brokerage firm expects consumption recovery to gather steam in calendar 2018. Firms in consumption-oriented sectors will see earnings pick up strongly in the second half of 2017-18 and beyond. Despite widespread optimism and equity markets touching record highs, fundamentals are still weak. Bloomberg data shows Sensex firms’ consensus earnings per share forecast for the current fiscal has been cut by 11.3% since April; for 2018-19, it has been cut by 4.8%. The 30-share Sensex now trades at 20.71 times 12-month forward earnings, making it one of the costliest benchmark gauges. Though Indian markets are expensive, with continuous earnings downgrades, foreign investors have remained invested in domestic shares. So far this year, foreign institutional investors have bought Indian shares worth $822.50 million, while domestic institutional investors, including mutual fund and insurance companies, have pumped in Rs748.02 crore.